With more than 275 applied examples and 10 projects, Access users can quickly build database solutions with ActiveX Data Objects (ADO), perform database tasks with Jet/Access Structured Query Language (SQL) and export/import Access data to and from XML both manually and programmatically. 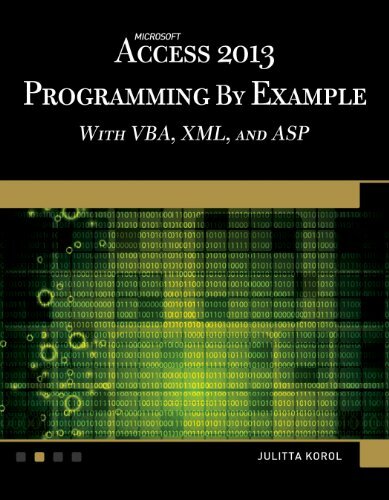 The book, which covers the latest release of Access and earlier versions, is divided into five parts: an introduction to VBA programming, manipulating databases with ADO, using DDL, event programming, and using ASP and XML. The text will show you how to write and debug your programming code with the Visual Basic Editor; understand and use common VBA programming structures such as conditions, loops, arrays, and collections; code a “message box” and reprogram characteristics of a database; query and manipulate your database from a Web browser with Active Server Pages (ASP) and many more practical techniques. Covers in great detail the latest version of Access and all of its features. Includes more than 275 applied examples and 10 projects. If you have any questions about this product by Mercury Learning & Information, contact us by completing and submitting the form below. If you are looking for a specif part number, please include it with your message.